Abbington Green Bed & Breakfast Inn, Asheville NC: Asheville Bed and Breakfast Agrees, "What Is So Rare As a Day In June?...." Asheville Bed and Breakfast Agrees, "What Is So Rare As a Day In June?...." In 1848 the poet James Russel Lowell wrote,"...What is so rare as a day in June? The, if ever, come perfect days..." That famous quote is part of the poem "The Vision of Sir Launfal". At our Asheville bed and breakfast, we surely agree that if ever there were a perfect day, it would very likely be in June. And those "rare" and "perfect days", very naturally, beckon us to step outside to enjoy the outdoors. And when we do, in June you will find the Asheville bed and breakfast garden filled with not only lovely flowers but heady scents. 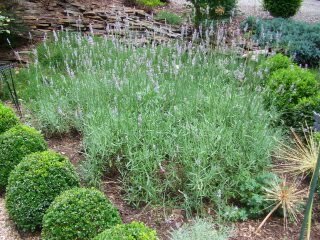 And partly that's because in June the lavender blooms. 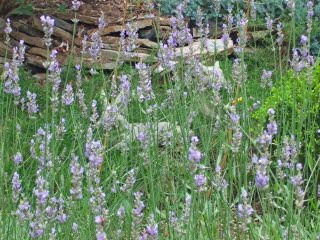 Now as a dyed-in-the wool Anglophile, I also love lavender because it reminds me of some of the fabulous old gardens in England where I have seen it and smelled it. 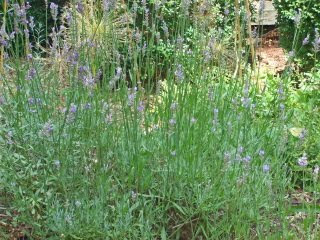 It also reminds me of some of the late-19th and early-20th century British garden designers like Gertrude Jekyll and Harold Peto who used lavender in their plans for its textural foliage, its bloom colors and, of course, for its scent. Lavender, afterall, you would expect to have flowers that are, well, lavender. But, the color spectrum includes darker purple, lighter lavender, pink and even some white. I favor, not surprisingly, the ones most often used by those late-19th century English gardeners. So at our Asheville bed and breakfast gardens, you'll see the varieties used by Gertrude Jekyll. But, even when the blooms fade, the foliage holds that wonderful scent that is most noted for its ability to relax you. That's why you'll find perfumes, soaps, bath grains and oils all infused with lavender. And, some people favor adding it to foods and beverages, as well. But truth be told, all you need to do is walk past it and rub your hands on it. Ah, such a fragrance! So, come and enjoy it on some of those fabled"rare" and "perfect days'" that are here in June!